The Defenders, men who believe, as is provided for in the United States Constitution, that all those accused of crimes are entitled to competent defense in a court of law . . .
Tony Landry, born in poverty and driven by his family history, has achieved amazing success as a defense counselor through no one’s efforts but his own. Newly made a partner in the prestigious Winston-Roe firm, he fully believes that truths come not in black and white but in shades of gray. He clashes with Kristine Granger, a young prosecutor from a background of wealth and privilege, who is fully convinced that there are no shades of right and wrong. 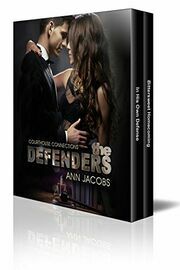 Despite the fierce attraction neither can deny, Tony must make the argument of his life to win Kristine’s heart—IN HIS OWN DEFENSE. A boxed set for your reading enjoyment, exclusively at Amazon. Enjoy!